Beetroot is one of the super food which is packed with enormous nutrients. Beetroot has various health benefits and beauty benefits. This red colour fruit can be consumed raw, cooked or as in juice form. It’s a low calorie veggie and has various anti-oxidants, minerals; vitamins.Presence of beatin gives red colour to this vegetable. Regular consumption helps in purifying blood and gives glowing skin. Oral intake or topical application helps to get rid off boils and acne. 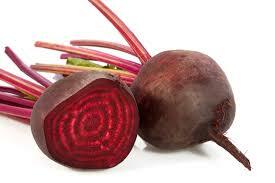 Beetroot has caratonoids which helps in keeping eyes, healthy and beautiful. Carotenoids present in beetroot helps in improving the quality of the hair. It increases the blood circulation in scalp and nourishes the hair follicles in turn promotes the hair growth. Silica present in it makes hair glossy. make a beetroot juice. Soak a cotton ball in juice and apply it on face. Leave it on face for a while and wash your face. take a slice of beetroot and rub gently on face. Leave it for a while followed with face rinse. you can add beetroot juice to your mud pack or fruit pack, gram packs. Topical application of beetroot gives pinkish tinge to your complextion thus giving a glow for skin. Also reduces blemishes and removes acne in regular usage. beetroot acts a natural dye. Add beetroot juice to henna and apply it on hair for an auburn tinge for your hair. apply beetroot juice directly to the scalp, leave it for a while and wash. It has anti-puritic properties. It helps in removing the dead cells in the scalp and prevents dryness of scalp. Application beetroot juice mixed with vinegar helps getting rid of dandruff problem. Add beet juice to any of your home made hair pack. Drink beetroot juice every day in the morning for a month to see amazing result. Just add beetroot to a blender, add little water-blend it, filter it and drink. I just use half a beetroot to extract juice; depending on the size of beetroot you can decide the quantity. If you can’t extract juice everyday, easy way is-extract the juice and freeze dry it. Add 2-3 spoons of freeze dried powder to water and consume it. No need to add sugar or any sweetener as it has a natural sugar. Follow this recipe for few weeks; you can see a healthy, glowing skin without any acne and blemishes as it feeds lots of nutrients to your skin. Consuming beetroot juice everyday may make your stool and urine reddish to pink. It is harmless. It is advised to start with quarter glass of juice a day and slowly increase the quantity over time. If you have Kidney stone please take doctor’s advice before consuming beetroot. If you have problem with low blood pressure, not recommended to drink more than half glass a day. As beetroot reduces the Blood pressure. Start your Beetroot juice Diet and enjoy the Beauty benefits. Wow...never knew beetroot can be so good!! Great, i was not aware of beet root hold so many beauty benefits, i am starting to eat beet root soon. Cn mix turmeric powder with beetroot...???? ?